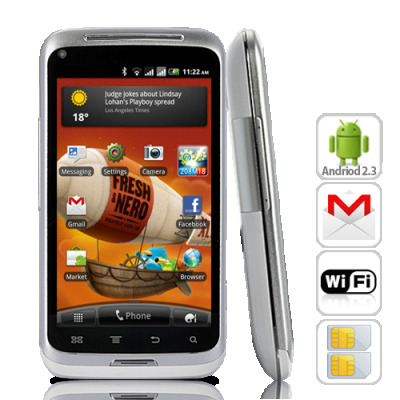 Successfully Added 3G Android Mobile "CyberRadiance" - 4 Inch Capacitive Display, WiFi, Dual SIM, 8MP Camera to your Shopping Cart. Watch as the CyberRadiance 3G Android Smartphone shines with its powerful hardware and impressive 4 inch capacitive screen. The CyberRadiance makes everything look better, brighter, and more brilliant than ever. The CyberRadiance Android Smartphone comes with a bright, colorful, and massive 4 inch multi-touch touchscreen that responds immediately to your touch. This allows you to easily slide your finger across the smooth screen to navigate through web pages, photos, eBooks, and more with the ultimate ease. At 800 x 480 resolution, everything also looks much better. From playing games to surfing the web and reading online reviews and news, you can be sure the CyberRadiance offers an unforgettably beautiful view. Fully compatible with WCDMA (2100mhz) as well as worldwide quadband GSM networks for calling and internet surfing, the CyberRadiance Android Smartphone conveniently offers you dual SIM card slots for both. It's also fully unlocked, so just stick your SIM cards inside and you're ready to go. Running on the Android 2.3 operating system, the CyberRadiance Android Smartphone provides you everything you need to organize and manage your busy personal and work lifestyle. You have easy access to your Notes, Calendar, Email, Social Networking and other vital sections of your task flow. Keep connected with all your friends and family with the integrated applications like Facebook, MSN, and Gmail. The almighty Android Marketplace lets you get access to hundreds of thousands of fun games, wallpapers, useful and interesting applications, many of which are completely FREE! This phone has everything you’ll need, and best of all, it’s available for an amazing bargain! With the CyberRadiance Android Phone, programs load faster, games play smoother, and you can feel the difference in quality. Know that you have a top-of-the-line device in your hands. This affordable Android smartphone is also the best bang for your buck today and brought to you at a factory-direct price that can't be matched. How do we do this? By cutting out the middle man and selling to you factory-direct with no markup and no extra fees. Order now and you can enjoy our next-day shipping! Access hundred of thousands of free apps, games, ringtones and much more with the Android Marketplace! I have had the phone for a couple of days now & I am very happy with its performance. It comes with the best manual I have received yet from Chinavasion. The phone has been very easy to set up. I was using WLAN, WiFi, my email accounts & maps etc. within minutes. Better than an iPhone I think & a fifth of the price. This is my 3rd Chinavasion phone & I have only had to replace each one when I've wanted to upgrade after around 18 months use. If you want a tech capable smartphone that is user-friendly, at a great price, then this looks like a good candidate. I would recommend.